Having been searching some sweets before, I finally got a chance to go to Orchid Room in Hotel Okura Tokyo. Hotel Okura Tokyo is located in Toranomon, Minato-ward. Closest station is Kamiyacho or Toranomon and about 5 minutes walk according to the webpage, but actually it was about 10 minutes as there're slight slope to get to the main building where the Orchid Room is. This year, 2012 is its 50th anniversary of the opening of Hotel Okura Tokyo and they serve Pannekoeken (Dutch pancake: thin and sticky) at Orchid Room as a special menu during breakfast and tea time. Pannekoeken was used to be available at breakfast for the guests only, but to celebrate the anniversary, it's on the menu for the visitors, too. When we got to Orchid Room, a tidily dressed waiter guided to a table. And we're handed out menu respectively. Center of the table, there's a little vase with real orchid. I chose French toast as booked and was thinking whether I should get Pannekoeken. While thinking what to do, he ordered afternoon tea. I asked the waiter how long Pannekoeken would be on the menu and he said at least it should be available till end of the year. I still couldn't decide but then he said I should just get it, so I asked the waiter to change the amount of French toast; instead of 2pcs, I asked 1pc for me. And yes, I ordered Pannekoeken. He chose Yorkshire Gold and I got China Rose Petal. Pots were covered with a soft and thick cover with orchid stitchwork for 5 minutes or so before pouring the tea. My China Rose Petal had less brown color to compare with Yorkshire Gold, and it had really relaxing rose flavor. When I looked at their tea page on website, it said rose petals were used to add fragrance to Orange Pekoe. Regularly, it's 2pcs but they happily make 1pc French toast upon request, served with maple syrup and butter. It looked like rolled egg and really thick but soft. Outside was really crispy but not burned at all with mouthwatering butter flavor. However, the inside was so soft and moist that it was hard to pick up a giant piece. The reason it needs to be booked is because of the way they prepare it. The bread is prepared overnight and once the order is set, they put in a low heated oven for 7-8 minutes till it gets golden. That's the key to make this French toast so soft, moist, and have elastic texture otherwise the French toast shrinks. As the waiter said, it was thinner and sticker than regular pancakes served with fruits (Asian pear, melon, blueberry, raspberry, banana, kiwi, and papaya. Also, maple whipped cream was brought. I took a bite of maple whipped cream, which I'd never heard or tried, and it was quite just by itself. It had smooth texture like cream but had deep maple flavor into it. The pancake looked thicker version of crape. Edge was crispy and it kept as it was till the last bite I had. 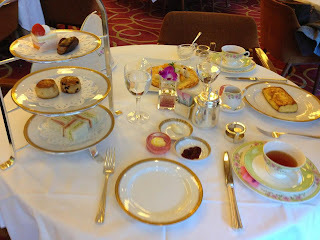 Cakes (strawberry shortcake and eclair), scones (plain and raisin), and sandwiches set in high tea stand of 3 plates. They kindly substituted beef for ham in sandwich when we only asked, "We don't eat pork." I liked scones a lot. Little scones were crispy and light, but had rich butter flavor and went well with butter, strawberry jam, and clotted cream. I'm glad to have both French toast and Pannekoeken with some bites of scones and cakes. Each plate was rich and flavorful and I was so satisfied. They open from the morning, but to get what we had today (French toast, afternoon tea set, and Pannekoeken) is available during tea time only. French toast needs to be reserved beforehand, so please call them and make a reservation.